I mentioned the SamsungApps Store a few days back, but now a video has been released that shows off some of its potential. The SamsungApps store is basically a smartphone-like app store for your Samsung home entertainment devices. It’s a good move – not only does it extend the features of your Samsung HDTV, Blu-ray and home cinema devices, letting you watch YouTube videos or Flickr pics from you HDTV for example, it also locks you into Samsung’s kit! But Samsung have much bolder plans than letting you download apps onto your TV: different Samsung devices can talk to each other via certain apps, giving you full control of your HDTV, for example, from your Samsung smartphone. An example shown in the video below comes from the Samsung booth, where they’ve been showing off a fishing game that’s controlled by a Samsung smartphone. 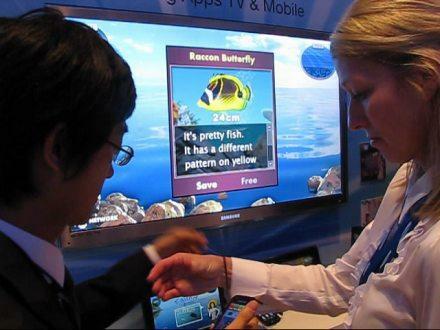 The app is played on the Samsung HDTV, but controlled by the phone, which also displays whatever it is you’ve caught. This is a neat demonstration of the technology, and although the game itself isn’t going to win any awards, it gives us a glimpse of how Samsung expects the technology to work in the future. That is, all home entertainment and mobile devices are connected, communicating, interacting with each other – and all made by Samsung! Indeed, this is my only reservation about the SamsungApp store. Although it’s innovative and open (you can develop your own HDTV apps for the SamsungApp store – just download the SDK when it’s released and build yourself an app! ), it does rather restrict you to Samsung technology. Still that’s only a minor concern – with an open app store, many of the Web’s best content sites will soon become available for your Samsung device whether it’s HDTV, Blu-ray or home cinema, and nobody says you have to use a Samsung smartphone to control it – you can still watch YouTube on your Samsung HDTV while owning an iPhone! The official announcement of the SamsungApps store can be seen in the video below.